Chef Bracken and his team are in the kitchen every week preparing the food needed for all our feeding events. 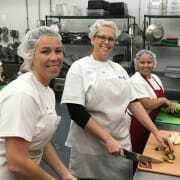 Our Recovered Food Program and "Catering for a cause" program is in full swing recovering and preparing several hundred meals each week in support of other nonprofit organizations. Our social enterprise and revenue stream offers a variety of catering opportunities with all proceeds going back to our feeding programs. Duties include prepping food, cutting vegetables and meats, cleaning kitchen equipment, packaging meals and other minimal tasks. Although we mostly focus on preparing meals, we also need assistance cleaning kitchen equipment and preparing for upcoming events, so some volunteers may be placed in other areas in the facility. Shifts are between 9am to 4pm, Monday through Friday. Must commit to the entire shift.